Coke Studio Season: Putting together a variety of lyrical expressions, Coke Studio sets out to create a track that can be classified as a modern form of qawwali with a gradual build up to a crescendo end. Qawwali traditionally borrows from various influences and verses. Atif Aslam in this season has merged Faiz Ahmed Faiz’s critically acclaimed Rabba Sacheya with Khuwaja Ghulam Farid’s universal love for God in Meda Ishq Vi Toon bringing together an interesting contrast. Rabba Sacheya is an example of Faiz’s expression of sorrow and anger for the suffering of humanity. It is a strong comment on religion and socialism where the writer is speaking to God, demanding better rights and more equality for all people. The poem is a reflection of the shift in Faiz’s work from romance to realism – seen through his use of imagery – as he started using poetry as a tool for social comment and spreading awareness towards collective suffering. Musical treatment of the track flows with this form. Originally he had performed Rabba Sacheya from his album Meri Kahani in 2008. ‘Larho Mujhey’ is one of Bilal Khan’s recent and un-released songs. The song was written and composed by Khan and talks of a sense of determination, willingness to fight for ones self and struggle to achieve his dreams. Musically the song borrows from various musical fields and comes to form a unique listening experience. Sufi poetry uses allegorical references to everyday life to communicate a deeper, spiritual meaning. The song ‘Ishq Aap Bhe Awalla’ revolves around the life of a woman in love filling water from a well. The woman in the song is filling water but her focus is somewhere else and the words of the song are all the things she wants to say to her beloved. Traditionally this song is performed at weddings. Coke Studio’s treatment encourages it to become a popular wedding song. According to Fareed Ayaz and Abu Muhammad the qawwali ‘Khabaram Raseeda’ was composed by their ancestors who are descendants of Mian Samat Ibrahim, a disciple of Amir Khusro. The qawwali has been presented in Raag Bageshri and is a composition of a ghazal written by Amir Khusro. The ghazal expresses Sufi philosophy, using imagery of the worldly love for a beloved as a means of representing love for God. Khusro writes that he just heard his beloved is coming to him and he is ready to lay down his life in wait for the arrival as he feels this dying man might be given new life with the anticipated union. 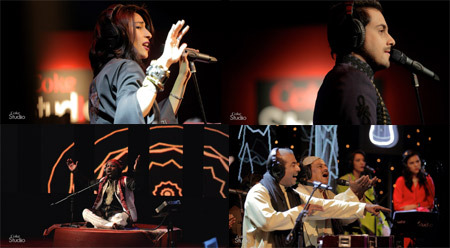 Coke Studio’s modal music treatment of the track renders new, previously unheard versions of qawwali. Written by legendary 18th century Sindhi poet, Shah Abdul Latif Bhittai, ‘Pere Pavandi Saan’ tells the story of Sindhi folk heroin Sassi, who searches for her lost lover, Pannu, after he was taken away from her during their wedding night. Sassi is from Bhambore where she married Pannu – a prince from Balochistan. After the wedding celebrations Pannu’s brothers intoxicated him and took him back to Balochistan while Sassi was asleep. When Sassi finds Pannu gone, she ran barefoot, across deserts to get to Ketch Makran in Balochistan and finds him. The song illustrates Sassi’s anguish and her frantic search for her lost love after she wakes up and finds him gone. In the chorus of the song Sassi is begging Pannu’s brothers to let him stay with her in Bhambore for one night. After a long journey when she is nearing his kingdom in Balochistan, tired, frantic and distressed, she asked God to protect her from the evils she met on her journey. God answered her prayers, the land shook and she was buried beneath. Pannu woke up to find out he was back in his own land and, like Sassi, he ran out in search of his lost love. Pannu prayed to God to protect him and help him and God gave him the same fate as Sassi. The husband and wife still lie buried together. Shah Latif’s poetry are the words of Sassi – her prayers and her longing – as she goes on her search to find Pannu.